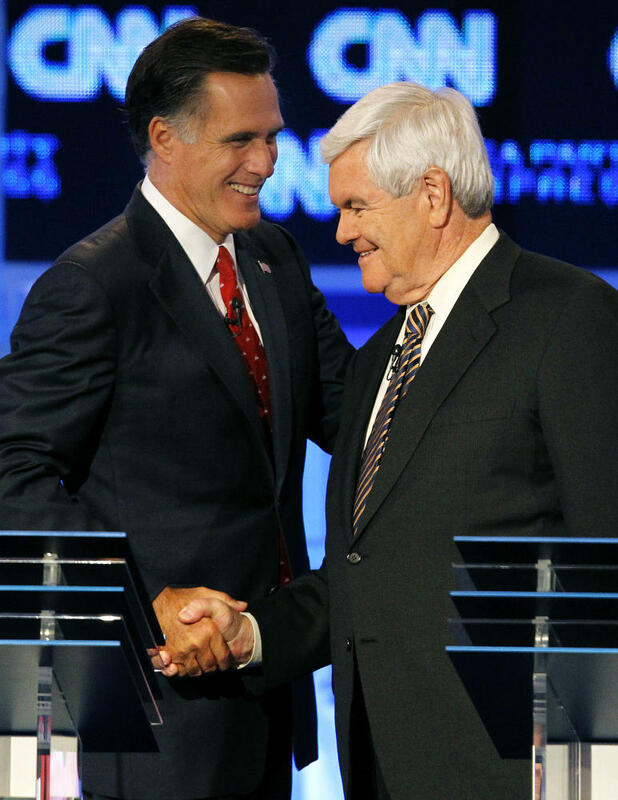 Republican presidential candidates Mitt Romney (left) and Newt Gingrich shake hands after a Republican presidential debate in Tampa, Fla. There are many flashpoints between Newt Gingrich and Mitt Romney as they battle for the Republican presidential nomination. Most of them are about character or leadership: Who can beat President Obama? Who's the real conservative? But Gingrich and Romney do have one big policy difference — and that's on immigration. For GOP candidates, there's always a tension when they have to talk about immigration. They want to win primaries — where many Republican voters are anti-immigration — and they want to be able to appeal to Hispanics in a general election, and that calls for the opposite approach. Gingrich and Romney come at this problem in different ways. At the latest CNN debate, Gingrich, the former House speaker, said: "I don't see how the party that says it's the party of the family is going to adopt an immigration policy which destroys families that have been here a quarter-century. And I'm prepared to take the heat for saying, let's be humane in enforcing the law without giving them citizenship but by finding a way to create legality." Romney, on the other hand, has taken a harder line shared by many in the GOP grass roots. "We've got to stop illegal immigration," Romney said. "That means turning off the magnets of amnesty: in-state tuition for illegal aliens, employers that knowingly hire people that have come here illegally." And the former Massachusetts governor went even further in an interview with Fox's Bret Baier, saying, "They should not be allowed to stay in this country and be given permanent residency or citizenship merely because they've come here illegally." Romney was trying to answer the sticky question of what to do with the 11 million illegal immigrants already in the United States. It sounded like he wants them to leave first and then apply for visas to return. "It makes more sense for them to go home," he said. So, which candidate has better navigated the tricky currents of Republican immigration politics? GOP strategist Karl Rove, who has not endorsed any candidate yet, thinks on this issue it could be Gingrich. "From a tonal perspective, I'm personally more in line with the opening thrust of what the speaker was saying. Newt was saying, we can't throw these people out," Rove says. "I will readily admit, though, that he and I are in the minority thinking that that's what we need to do inside the Republican Party." Gingrich has been working on this issue for a long time, telling Republicans they need to find a position somewhere between amnesty and deportation. Several of Gingrich's many companies are designed to reach out to Hispanics, including a bilingual website called The Americano. Most Republican analysts believe a GOP candidate needs 40 percent of the Latino vote to win the White House. And some worry that Romney is making that goal harder to reach. "If you think about the so-called negative narrative on immigration ... it basically comes from Gov. Romney," says Alfonso Aguilar, who runs the Latino Partnership for Conservative Principles. "In the last debate, it sounded like he was closing the door to any type of legalization. It does hurt him. ... And he does risk not being able to get enough Latino voters, if he's the nominee, to win back the White House." It's ironic that on this issue, Gingrich — who came to power as a bomb-throwing insurgent — is the centrist, sticking to the position backed by the business community, while Romney — who personifies the corporate wing of the GOP — is throwing his lot in with the Tea Party base. "I think [Romney] has been ill advised, because he hears the traditional strategy from political pundits that say, you know, 'Forget about the Latino community during the primary. They don't play a role in the GOP primary. Engage them after you're the nominee.' Well, Latinos are listening to you right now," he says. "Many of the debates were broadcast in Spanish through CNN en Espanol or Univision or Telemundo. They know exactly what Mr. Romney has been saying." As for Gingrich, the predictions that his remarks on immigration would prove toxic to Republican voters haven't come true. Instead, Gingrich has surged. And in the latest Washington Post-ABC News poll, three times as many Iowa Republicans say they trust him on immigration as trust Romney. Aguilar says Gingrich's experience challenges conventional wisdom on this issue. "What's happening with Gingrich shows again that the majority of Republican voters are not anti-immigration," he says. "As long as a candidate includes border security as part of his plan, Republican primary voters will support a candidate like that." Gingrich's views even won him a positive review from Jorge Ramos, the influential Univision anchor — usually no fan of Republicans on immigration policy. Ramos called Gingrich's plan a good start. With Obama polling below 50 percent with Hispanics, Republicans see an opportunity. But first they have to decide how to resolve their own debate. Mitt Romney's campaign is expected to shift strategy today and attack Newt Gingrich on a series of issue. The new head-on approach comes as Gingrich rises in the polls. One area where there's a big policy difference between the GOP rivals is immigration. NPR's Mara Liasson looks at they're treating that issue. MARA LIASSON, BYLINE: There's always a tension for Republican candidates when they have to talk about immigration. They want to win primaries, where many republican voters are anti-immigration and they want to be able to appeal to Hispanics in the general election - and that calls for the opposite approach. Newt Gingrich and Mitt Romney come at this problem in different ways. Here's Gingrich at the latest CNN debate. NEWT GINGRICH: I don't see how the party that says it's the party of the family is going to adopt an immigration policy which destroys families that have been here a quarter century. And I'm prepared to take the heat for saying, let's be humane in enforcing the law without giving them citizenship but by finding a way to create legality. LIASSON: Romney, on the other hand, takes a harder line shared by many in the GOP's grassroots. MITT ROMNEY: We've got to stop illegal immigration. That means turning off the magnets of amnesty, in-state tuition for illegal aliens, employers that knowingly hire people that have come here illegally. LIASSON: And Romney went even further in an interview with Brett Baier on Fox. ROMNEY: They should not be allowed to stay in this country and be given permanent residency or citizenship merely because they've come here illegally. LIASSON: Romney was trying to answer the sticky question of what to do with the 11 million illegal immigrants already here. It sounded like he wants them to leave first and then apply for visas to return. ROMNEY: I think it makes more sense for them to go home. LIASSON: So which candidate has better navigated the tricky currents of Republican immigration politics? GOP strategist Karl Rove, who has not endorsed any candidate yet, thinks on this issue it could be Gingrich. KARL ROVE: From a tonal perspective, I'm personally more in line with the opening thrust of what the speaker was saying. Newt was saying we can't throw these people out, we can't just sort of rat 'em out and send them home. I will readily admit, though, that he and I are in the minority thinking that that's what we need to do inside the Republican Party. LIASSON: Gingrich has been working on this issue for a long time telling Republicans they need to find a position somewhere between amnesty and deportation. Several of Gingrich's many companies are designed to reach out to Hispanics including a bilingual website called the Americano. Most Republican analysts believe to win the White House a Republican candidate needs 40 percent of the Latino vote. And some worry that Mitt Romney is making that goal harder to reach. Alfonso Aguilar runs the Latino Partnership for Conservative Principles. ALFONSO AGUILAR: If you think about the so-called negative narrative on immigration during the debates, it basically comes from Governor Romney. I mean in the last debate, it sounded like he was closing the door to any type of legalization. It does hurt him, and he does risk not being able to get enough Latino voters if he's the nominee to win back the White House. LIASSON: It's ironic that on this issue Gingrich, who came to power as a bomb-throwing insurgent, is the centrist sticking to the position backed by the business community. While Romney, who personifies the corporate wing of the GOP, is throwing his lot in with the Tea Party base. Aguilar is mystified. AGUILAR: I think he's been ill advised because he hears the traditional strategy. You know, forget about the Latino community during the primary, you know, they don't play a role in the GOP primary, engage them after you're the nominee. Well, Latinos are listening to you right now. Many of the debates were broadcast in Spanish through CNN en Espanol or Univision or Telemundo. They know exactly what Mr. Romney has been saying. LIASSON: As for Gingrich, the predictions that his remarks on immigration would prove toxic to Republican voters have not come true. Instead, Gingrich has surged, and in the latest Washington Post ABC news poll three times as many Iowa Republicans trust him on immigration as trust Romney. Alfonso Aguilar says Gingrich's experience challenges conventional wisdom on this issue. AGUILAR: What's happening with Gingrich shows that the majority of Republican voters are not anti-immigration. As long as a candidate includes border security as a part of his plan, Republican primary voters will support a candidate like that. LIASSON: Gingrich's views even won him a positive review from Jorge Ramos, the influential Univision anchor, usually no fan of Republicans on immigration policy. Ramos called Gingrich's plan a good start. With president Obama polling below 50 percent with Hispanic Republicans see an opportunity, but first they have to decide how to resolve their own debate. Mara Liasson, NPR News, Washington. WERTHEIMER: This is NPR News. Transcript provided by NPR, Copyright NPR.